Perhaps the best way to broach the subject of the three weakest spots in the potential 2014 Red Sox roster is by making a good old Compliment Sandwich. Put on your aprons and get out the fixin’s, Red Sox fans. Here’s the first slice of delicious, fresh-baked sourdough to lather up with some mound mustard: the same steady menu of starting options — Jon Lester, Clay Buchholz, John Lackey, Jake Peavy, Ryan Dempster and Felix Doubront — will remain intact, and GM Ben Cherington further shored up an already exemplary bullpen of southpaws (Craig Breslow, Andrew Miller, Drake Britton) and righties (Brandon Workman, Junichi Tazawa, Koji Uehara) by inking reliever/closer Edward Mujica and trading for RHP Burke Badenhop. Now, let’s prepare the other half of our sandwich by slapping on some offensive mayo with the return of all-father David Ortiz, beard brothers Mike Napoli and Jonny Gomes, eminently durable Dustin Pedroia, the acrobatic Shane Victorino and key utility cogs like Mike Carp and Daniel Nava. Let’s swap out Jarrod Saltalamacchia for A.J. Pierzynski and make a possible everyday player out of Xander Bogaerts. Now, the hard part — filling the sandwich with heaping helpings of recrimination and rebuke. 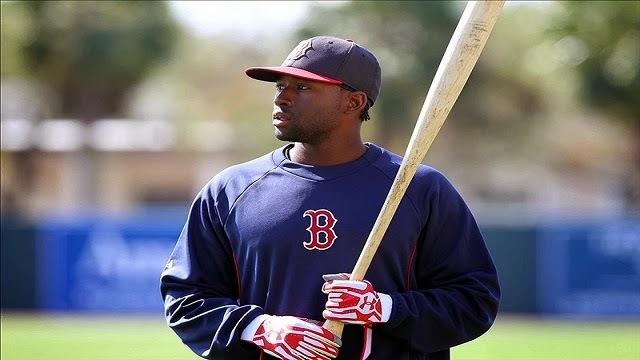 1) Centerfield: Considering the loss of speedster Jacoby Ellsbury — who departed Boston to play in pinstripes for a seven-year, $153-million jackpot — this is potentially the most glaring hole in the roster, with Jackie Bradley Jr. the heir presumptive. While a case can be made that Bradley Jr. is a better defensive outfielder than Ellsbury and shows the same hustle on the basepaths, there are plenty of problems to worry about when he’s at the plate. Potential solution: If Bradley, Jr. continues to struggle at the dish, shift Victorino to center, slot Nava in right, keep Gomes in left, have Carp as the fill-in or give up-and-comer Bryce Brentz a shot. 2) Shortstop: There’s a lot up in the air on the left side of the Boston infield, and most of it at the old favorite revolving-door position of shortstop at Fenway. Cherington traded for Jonathan Herrera as a backup, but the question remains: who, exactly, will he be backing up? While Herrera is a solid defensive stand-in, he isn’t an everyday player. With Jose Iglesias being shipped off to Detroit for Jake Peavy at the trade deadline and the as-yet unsigned Stephen Drew floating in free-agent limbo, Bogaerts appears the likely candidate, and would ably fill the hole between second and third. But that plan presupposes that Will Middlebrooks would be penciled in at third and not Bogaerts, who could be an offensive upgrade at the hot corner. Potential solution: Bring Drew back. Shift Bogaerts over. 3) Third base: Tied directly into the shortstop snag is third base, where Middlebrooks has been good defensively but has stumbled for stretches at the plate. If Drew is re-signed, Cherington and manager John Farrell will likely keep Bogaerts at third, with Middlebrooks either platooning or backing him up. If that’s the case, Middlebrooks could become trade bait, as hot prospect Garin Cecchini is waiting in the wings and Brock Holt could also serve as relief. Potential solution: Bring Drew back. Let Bogaerts and Middlebrooks fight it out in Fort Myers.